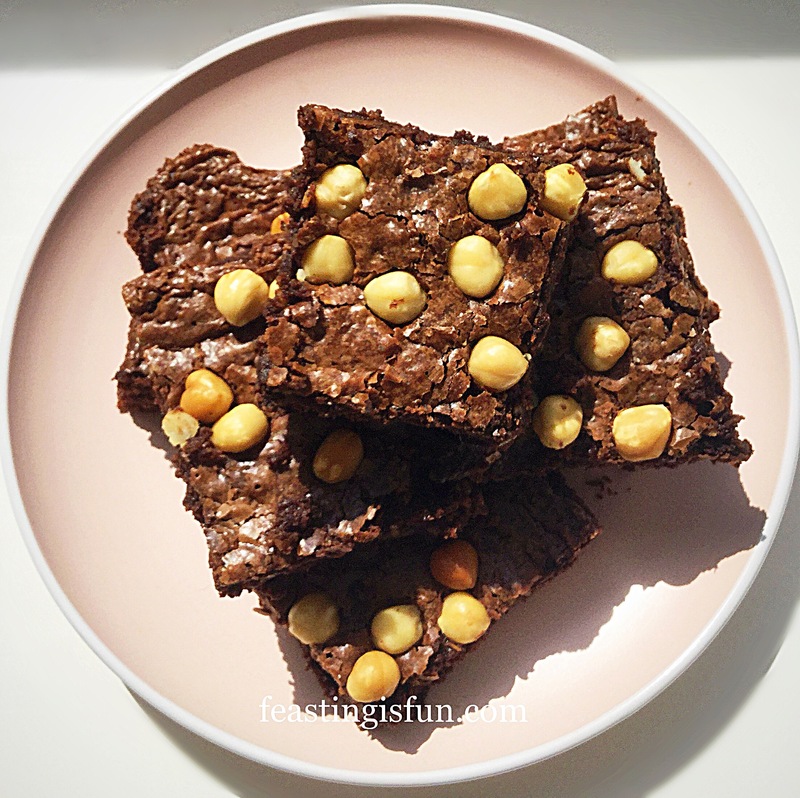 If you are a fan of nuts and brownies I can guarantee you will be mad for these Chocolate Fudge Double Hazelnut Brownies. Packed with an almost obscene amount of chocolate, gives the dense fudge texture and taste required in all great brownies. 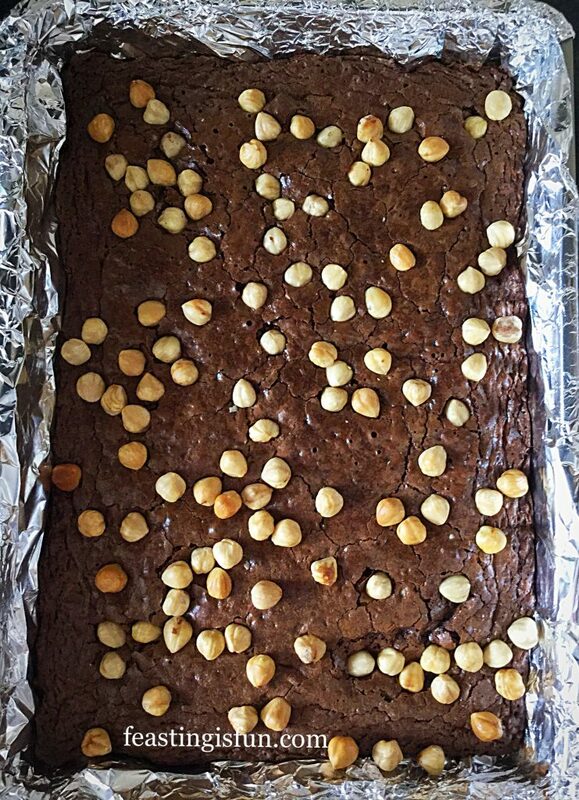 Also add in a ridiculous amount of chopped and whole hazelnuts and the resulting flavour is Ferrero Rocher in a brownie. 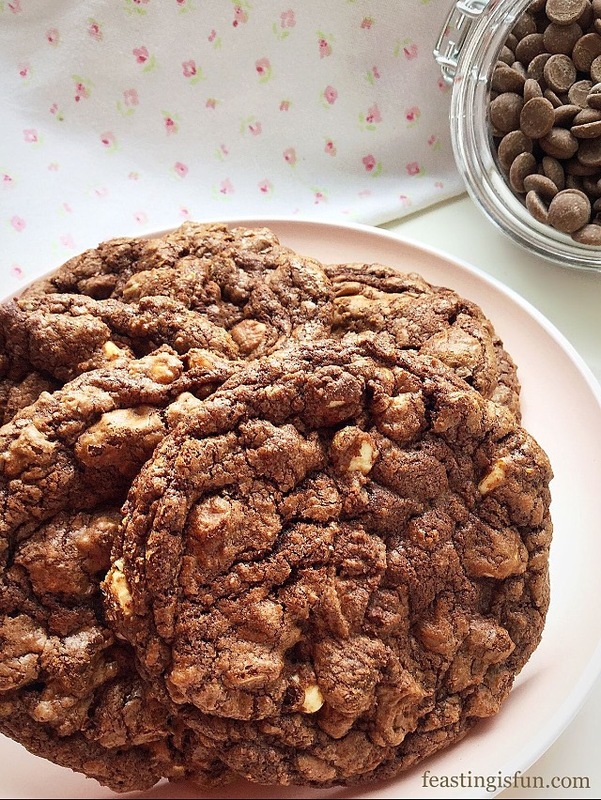 Gooey, crunchy, with the incredible combination of chocolate and hazelnut flavours. Chocolate Fudge Double Hazelnut Brownies. 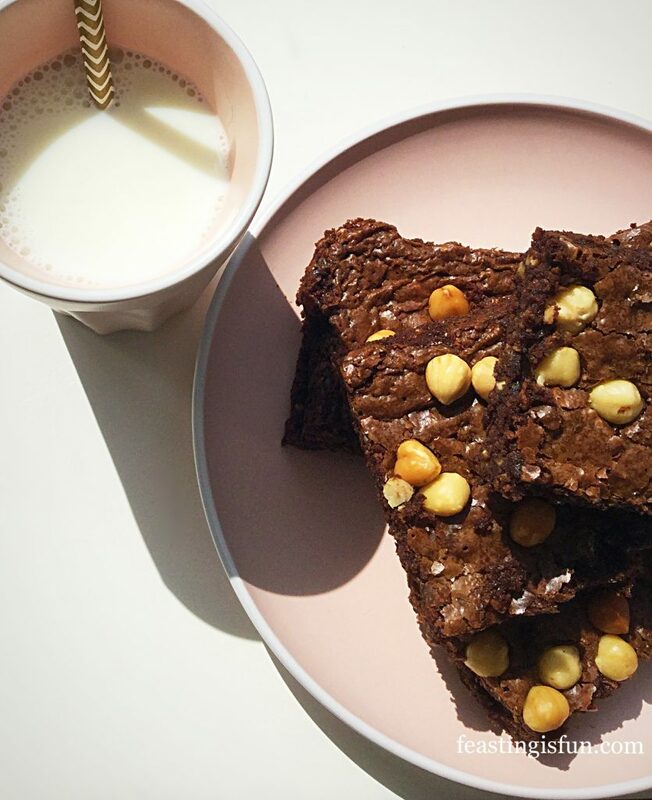 Since eating a brownie is an indulgence, it makes sense to eat only the best. Made using 400 grams of good quality chocolate, dark, treacly sugar and aromatic vanilla extract, the basic brownie is already exceptional. 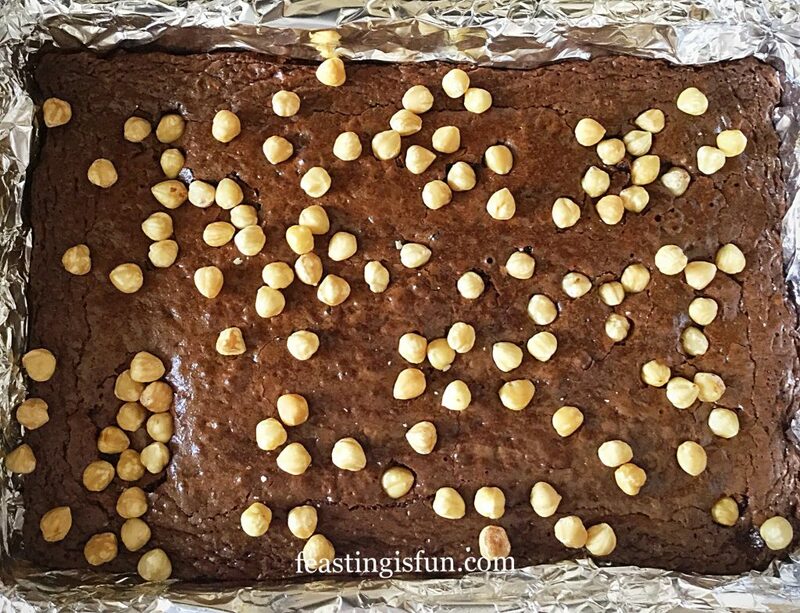 In addition, adding roasted, chopped hazelnuts to the brownie batter, lends another layer of flavour. Finally, whole hazelnuts, roasted during the baking process, completes the exceptional flavour profile. 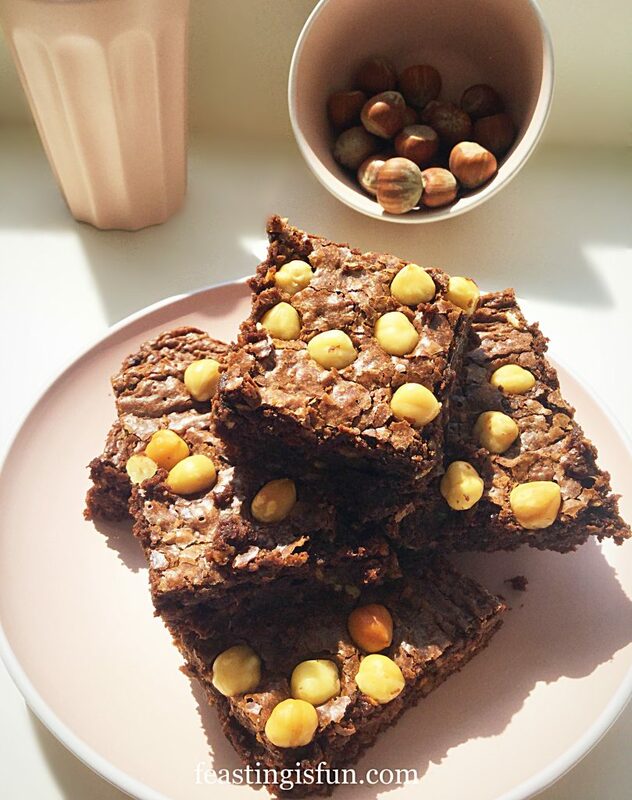 A plate of Chocolate Fudge Double Hazelnut Brownies. 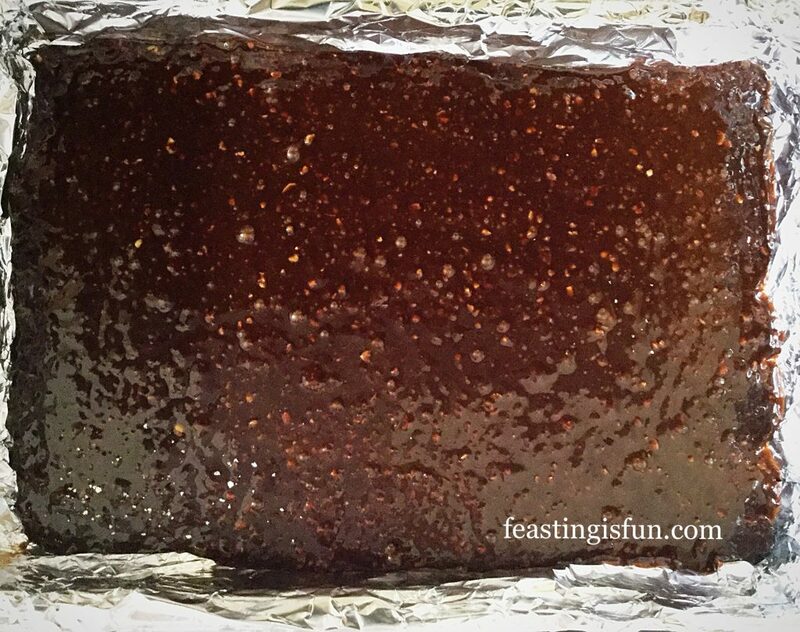 You will need a 22.5cm x 30cm (9″ x 12″) deep tin, lined with foil or baking parchment. First of all break or chop the chocolate into chunks and place in a medium, heatproof, microwaveable bowl. Add the butter to the chocolate. Heat, using a microwave, on medium power, for 30 second bursts. Stir between each heating period. As soon as the chocolate starts to melt remove the bowl from the microwave. 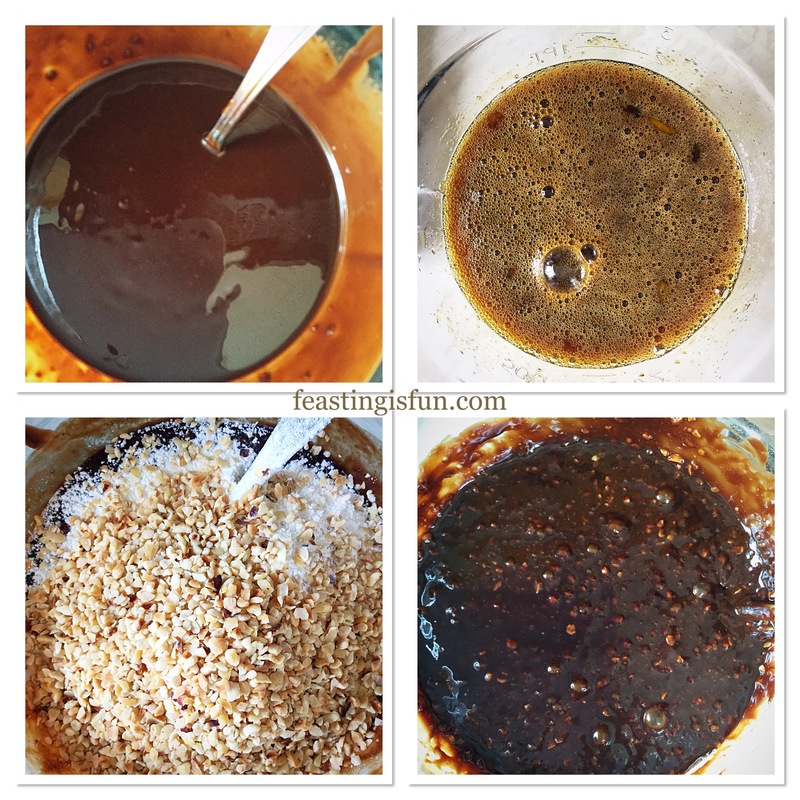 Continue to stir until all of the chocolate is melted and combined with the melted butter. Set to one side to cool. Next, into a separate bowl, add the eggs, sugar and vanilla extract. Stir to combine the ingredients. Once the chocolate mixture is approximately body temperature pour the egg mixture in and stir constantly until the mixture is combined. Sieve the flour and bicarbonate of soda on to the combined mix. Now add the chopped, roasted hazelnuts. Stir the flour and nuts into the chocolate mix. Nutty brownie batter ready for the baking tin. Chocolate Fudge Double Hazelnut Brownies ready for the oven. Unlike baking a cake, where air bubbles are needed to help the cake rise, brownies are rich and dense with very little rise. To encourage an even bake, rap the filled baking tin sharply on the worktop. Doing so encourages any air bubbles present to rise to the surface of the batter. Place the baking tin in the centre of the oven and bake for 10 minutes exactly. Remove the baking tin after the initial baking time has elapsed. The surface of the brownies will have just started to set. Sprinkle over the additional whole hazelnuts, use the back of a spoon to gently press into the surface of the brownie. Take care as the brownie tin will be very hot. 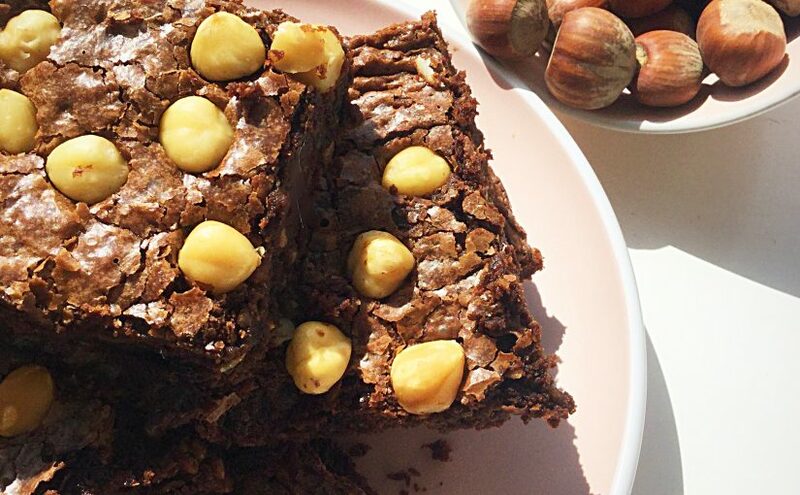 Whole hazelnuts give crunch to the finished bake. Return the tin to the oven and continue to bake for 20-25 minutes. 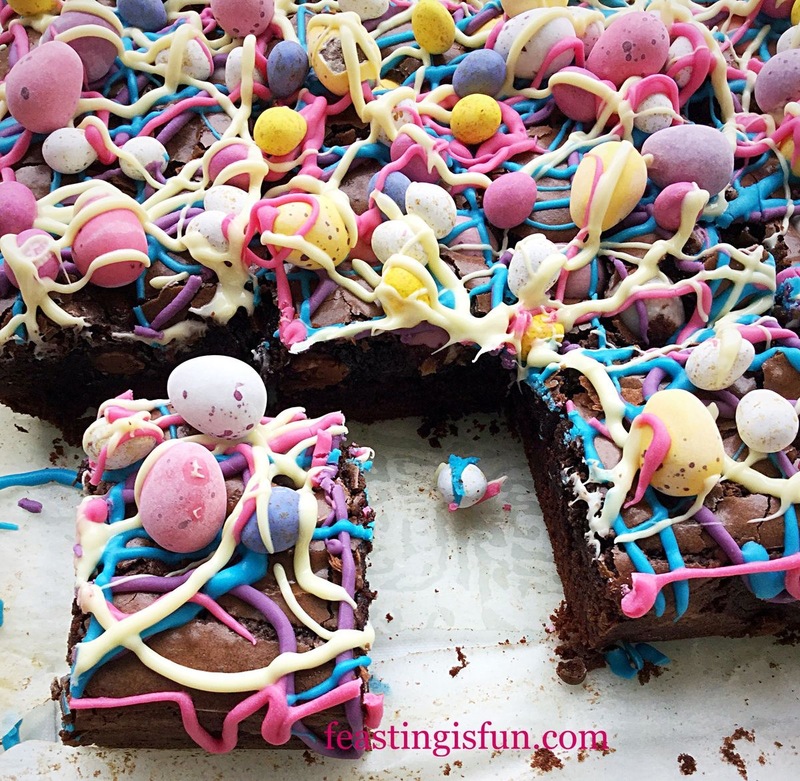 The brownies are baked when set, with only a hint of a wobble in the centre. As soon as the brownies are baked remove from the oven and place the tin on a cooling rack. 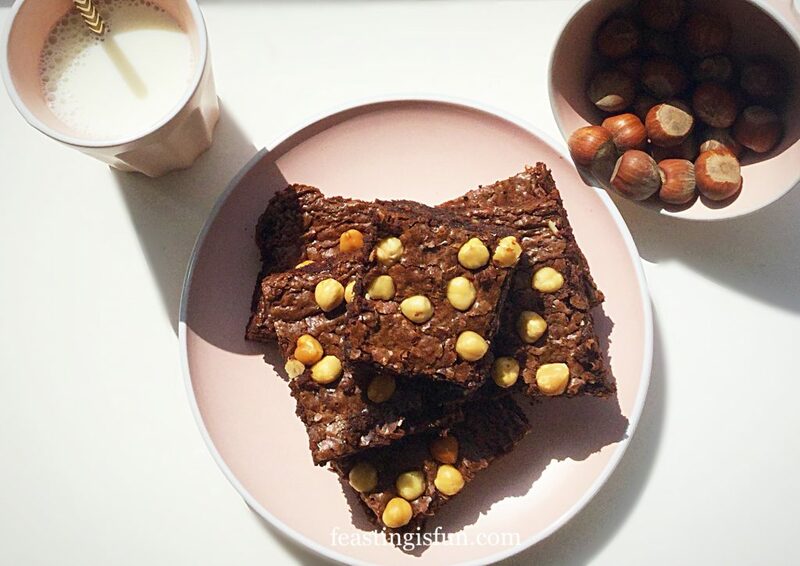 Chocolate Fudge Double Hazelnut Brownies cool in the tin. Leave the brownies to cool in the tin. Or if you simply cannot wait, cool slightly, scoop portions of brownie into bowls and top with vanilla ice cream! Cut the cooled brownie slab into 3 even sized widths, then cut across at 5 evenly spaced lengths. 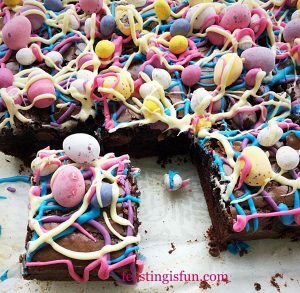 A palette knife may also be used to slide between the base of the brownie and foil. Although the foil/baking parchment should easily peel away. 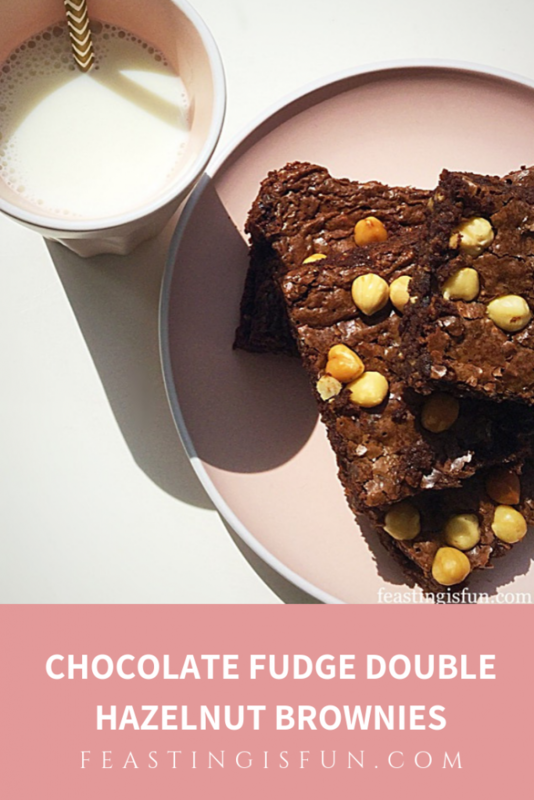 Chocolate Fudge Double Hazelnut Brownies very tasty. Serve slightly warmed (20 seconds in the microwave) with a scoop of ice cream. Alternatively, serve with a cold tumbler of milk. Once cooled keep in an airtight container for up to 5 days. Although, who’s kidding that they will last that long? Definitely not in this house! 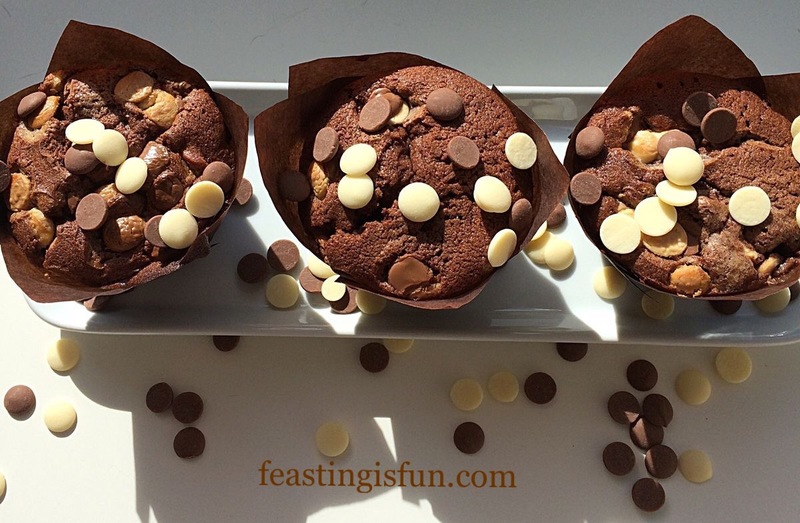 Baking cakes, brownies, muffins and cookies at home really is fun. And once a particular recipe is mastered it can be adapted to personal taste. Since you are the baker, you get to decide if hazelnuts or alternatively peanuts are used in your bake. As a result you get to create your own, personalised feast. Have fun creating new feasts in your kitchen. No part of this post may be replicated or copied without the written consent of the owner. Please see my Disclosure Policy.